Here at APB we are ready to provide you with the best car, 4x4 and van tyres, at the best prices with a choice of big brand names or budget brands, whether it’s a tyre for everyday road use, or a more specialist tyre, APB can both expertly advise and competively quote the best tyres for your requirements. Fitting – Removal – Replacement – Rotation – Balancing. Puncture Repair – Tubeless and inner tube repairs. Snow/Mud chains available (certain sizes available for hire). Competitive quotations on all types of 4x4 tyres and inner tubes for all budgets. – Reduced Tyre Wear – Incorrect wheel alignment is the major cause of premature wear, particularly on front tyres. 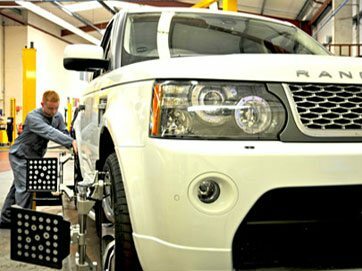 When correctly aligned, tyres will last much longer and save thousands of pounds over the life of a vehicle. – Better MPG – With wheels incorrectly aligned, the ‘scrubbing’ adds greatly to the rolling resistance. The extra effort to push the tyres greatly decreases vehicle MPG. – Safer Handling – The wear caused by incorrectly aligned wheels increases wear on certain parts of the tyre. As uneven wear increases, the vehicle may pull to one side or the steering will vibrate. Wheel balance has been lost and handling suffers. Punctures can be repaired providing they meet with British Standard AU159. Upon inspection of the tyre, APB will be able to advise you if your tyre falls into this category. 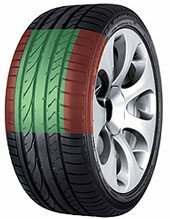 A tyre can only be repaired in the central area of the tyre (the part marked in Green) – the sidewalls (marked in Red) are not repairable, and for V rated tyres and above, only one repair is allowed. 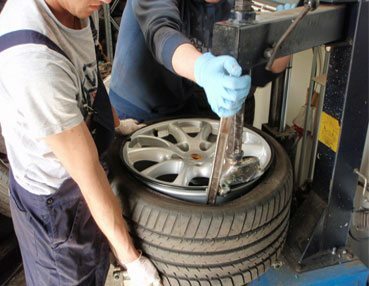 However, before any repair is carried out, the tyre must be fully inspected for any signs of internal damage which could cause tyre failure.